Paul Stanley, singer in the rock band KISS, says "I'm virtually deaf on my right side" because he was "born without an ear canal..I've had an implanted hearing aid for years now." Watch the CNN video interview with him below on DeafNewsToday.com (with captions). Today (March 30) in 1980 the Broadway production of Children of a Lesser God opened in New York. Live Streaming with HD Closed Captioning will be demonstrated at the National Association of Broadcasters convention in Las Vegas next weekend. The ViewCast Corporation plans to show off its Niagara 9100-4D streaming system. The digital high-density encoder platform handles up to four HD SDI inputs at the same time making it an attractive multi-channel stream option for television. There's more information here. Randy Pease was struck by a car on Saint Patrick's Day and killed. Local media reports the deaf-blind man was forced to live in a home 100 miles away from his Virginia Beach home because mental health officials told his family there was no room for him closer to where he lived. WWBT-TV in Richmond, Virginia has a video report (with captioning). The Richmond Times-Dispatch offers a written story here. A UK hospital is being accused of failing to provide an interpreter for a deaf patient--and possibly performing surgery without her consent. Scotland’s Public Services Ombudsman, Jim Martin, says the woman was unable to communicate with the staff of Ninewells Hospital located in Dundee for 12 days. During her hospital stay, the unnamed patient had her appendix removed. Martin is accusing the hospital of not putting enough effort into finding an interpreter. The patient used BLS (British Sign Language) and had little lip-reading ability. She handed staff members interpreter cards and even pointed at a poster on the wall repeatedly. It said the hospital would provide an interpreter when needed. But it turns out the outdated poster included the wrong contact information. Martin says Section 20 of the Equality Act of 2010 clearly says that when the staff was first alerted to the need, there needed to be a plan put in place to provide the patient with the means necessary to communicate with the staff. In this case, a sign language interpreter. The hospital eventually did make two calls to a terp service over the weekend, but without success. Hospital officials complain there is a shortage of interpreters in the UK but agreed to change their procedures--including allowing patients to schedule an interpreter themselves and training staff on the use of basic sign language. Read the PDF report here. Watch the video report from KDKA-TV in Pittsburgh in the video below on DeafNewsToday.com (captions available). It won't come as a surprise to find out that the Maryland School for the Deaf Academic Team beat out 20 teams to win Gallaudet's 17th annual National Academic Bowl. This is the 4th straight victory for the Orioles. Senior Ethan Sonnenstrahl was named the most outstanding player. Irvine, California's University High School won second place, while the Public Schools from Tucson, Arizona took home third place. The Indiana School for the Deaf of Indianapolis placed fourth. We told you yesterday about a lawsuit filed against a California nonprofit for allegedly failing to provide interpreters. KOVR-TV has this video report (with captioning). A Gallaudet baseball star is making the most of his senior shortstop for the Bison. Read the story here. Find out about the redesign of the old Harkin Computer Lab at Gallaudet University. Read the story here. Denver pre-schoolers show off their circus skills as part of a showcase to promote their school's deaf and hard-of-hearing program. Watch the video below or read the story here. A look at some of the program's available to parents in eastern Tennessee from the Chattanooga Times Free Press here. The EEOC is going after a nonprofit near Sacramento for failing to provide interpreters for one of it's employees. Homeyra Kazerounian is deaf and works as an instructional aid at Placer ARC, which ironically provides independent living services for people in Placer County, California. Kazerounian had a good record at the organization's Auburn facility but was transferred to the Placer office in 2008. Her supervisors refused to provide interpreters for her training sessions or their and mandatory staff meetings. The Iranian-born Kazerounian eventually resigned because she couldn't do her job. The EEOC says it attempted to come to an agreement with Placer ARC before filing the lawsuit. There are more than 700 chapters of The Arc around the country. Even though other noises can reach up to 20kHz (kilohertz) in range, most hearing aids only pick up sounds up to 5-6kHz. That leaves out some of the higher frequencies used in speech. Cut off the higher frequencies, words like "finding" and "signing" are nearly identical. Phones compound the problem by compressing the range further. Brian Moore of the University of Cambridge say they've come up with a way to boost the upper range of hearing aids. Find out more at the Economist here. Deaf hockey players must have a hearing loss of 55 decibels or worse to participate and cannot wear hearing aids on ice. Read the story here. WHEC-TV reports on the science fair that took place today in Rochester for Deaf and Hard of Hearing students. Watch the video below or read the story here. The Justice Dept. is expected to issue new regulations on website accessibility later this year that could take a broad view of the ADA's jurisdiction over websites. Read it in the Wall Street Journal here. Arapahoe County and the city of Englewood, a Denver suburb will pay $35,000 to William Lawrence and the Colorado Cross-Disability Coalition who sued for failing to provide them qualified interpreters. The agreement with the Justice department includes staff training on ADA law and posted signs about the availability of services for the hard of hearing. Arapahoe County and Englewood also agreed to use modified handcuffing when dealing with anyone who uses sign language to communicate. Lawrence was arrested in 2011. Englewood officers did not provide him with an interpreter during questioning and he was kept handcuffed, leaving him unable to communicate. A man is in police custody for killing a former Rhode Island School for the Deaf. Her body was found inside a 55-gallon drum at a Harlem apartment. Bismark Lithgow of Manhattan is charged with killing 19-year-old Francis Angelica Alfonso Pellerano. The deaf woman suffered multiple stab wounds to the body. They had apparently been dating after meting on the internet, but she planned to leave him to move to the Dominican Republic. Partially deaf student becomes the 2nd-youngest person to win the Metropolitan Opera competition. Watch the video below from KLS-TV or read the story here. Southern Cal high school senior holds a showing of her photography. Danielle Seiss worked for months on her senior project. Read the story here. Helen Keller wrote in 1903 “Literature is my Utopia. Here I am not disenfranchised. No barrier of the senses shuts me out from the sweet, gracious discourse of my book-friends.” Yet more than a century later, the vast majority of the world’s printed and digital books—and many television shows, movies, video games, and other copyrighted works—still aren’t accessible to people with disabilities." Read more about how U.S. law is working against efforts to caption online videos. Read the story here. NBC's Today show featured a video report this morning about a woman who decided to get cochlear implants. Videos of 26-year-old Amy Barber hearing the voices of her parents and her 6-year-old son for the first time were posted last fall, but they went viral this week when Reddit users began sharing it. Watch the video below (captions included). You can read the story here. The EEOC is taking Toys "R" Us to court for alleging not providing a sign language interpreter for a woman who applied for a job at a store in Columbia, Maryland in 2011. When Shakirra Thomas was called for a group interview she requested an interpreter. But the store told her she would have to provide her own, in violation of ADA law. The store later refused to give her information about her application. The EEOC contends Toys "R" Us refused to hire Thomas because she is deaf. The company refused to settle with the agency and now faces legal action. It's not commenting on the lawsuit. An insurance company will pay for the cochlear implant surgery of a 5-year-old Georgia boy. The family of Carson Rubin of Monroe (east of Atlanta) was first told by Coventry Health Care it would not do so. The family went ahead and began trying to raise the money. Coventry says it will also change its group policy to cover cochlear implants, according to Carson's mother. His surgery is now scheduled for April 19. A petition on Change.org got more than 100,000 signatures, a story that was picked up by newspapers and TV stations. Carson was born with auditory neuropathy, which left him legally deaf. Find out more about the Rubins on their Facebook page here. The BBC reports on a UK man who attended court Friday to find out the fate of one of the gang members who stole expensive equipment from his shop. Watch a video report or read the story here. On this date (March 17) in 2008, Marlee Matlin made her debut on Dancing with the Stars. The Oscar winner was among a dozen celebrities who signed on to compete, including pro football player Jason Taylor, Olympic skater Kristi Yamaguchi, R&B singer Mario, and actors Shannon Elizabeth, Priscilla Presley, Cristian de la Fuente, and Marissa Jaret Winokur. When Matlin was eventually voted off the show after making it through several rounds, she thanked the judges, her family and Henry Winkler for his support. She also thanked Fabian Sanchez her dance partner "for giving me the most beautiful art of dance in my life." Robbie Maggiulli is at the New Jersey state wrestling championships today in Atlantic City. Find out how he has amassed a record of 35-4 in an article here. A deaf student won this year's Poetry Out Loud competition for the entire state of Iowa. Dakota Meyer is a junior at Iowa School for the Deaf in Council Bluffs. He took the title at the State Historical Museum of Iowa in Des Moines with his performance of Henry Wadsworth Longfellow's A Psalm of Life and Edwin Arlington Robinson's Miniver Cheevy and Richard Cory. The effort earned $200 for Meyer and $500 for his school. Next month, Meyer heads to D.C to represent Iowa in the Poetry Out Loud National Finals. The contest will hand out $50,000 in awards and school stipends. Meyer is only the second deaf student to compete in the national contest. The first came from Oregon four years ago. Maggie Donaldson is the 50th to girl hold the title Miss Smiling Irish Eyes. But a more important number than that, she is the first in the Pittsburgh contest to win who was born deaf. Watch a video report below on DeafNewsToday.com from KDKA-TV (includes captions) or read the story here. A film about a priest abusing deaf children opens in Australia. Read a review here. DeafNation Expo hits Austin tomorrow (March 16). Join the trade show for exhibitions and entertainment at no charge. You'll find it at the Palmer Events Center. Find out more here. Deaf Missions is releasing a new video for deaf children called Big Bible Stories: Elijah. It's the fourth episode in the series that includes a live deaf actor with animated backgrounds and characters using both ASL and English. Find out more about the Iowa-based organization here. There a sample video below. New York Mayor Michael Bloomberg is launching a new health initiative called the Hearing Loss Prevention Media Campaign. It's designed to inform New Yorkers about the risks of listening to loud music and will target young music listeners through social media. The campaign will cost a quarter of a million dollars and is being paid for through a grant from the Fund for Public Health. An information page on the website said the campaign would primarily target young digital music consumers through social media. Read more at the website of the Fund for NY Public Health here. Cover up at deaf school? Parents of students who attend a state school are suing because administrators allegedly covered up the sexual abuse of five children by a teen at the school. The former principal of the Colorado School for the Deaf and the Blind says its not true. The school kept records but did not report the assaults to law enforcement as required by law, according to police. Another student admitted assaulting other students to school officials in 2011. Lawyers for former principal Louis Tutt appeared in court for a hearing yesterday (Thursday), asking that the lawsuit be thrown out, claiming their client has immunity as a state employee. An arrest warrant has been issued for Tutt who is not in the state. The BBC has a video showing what it is like for a deaf teacher to work in a hearing classroom. You can watch it here if you are in the UK. During a recent outing to Winter Park, area deaf and hard of hearing students bonded over fresh powder, the shared experience of hearing loss and the chance to benefit from the coaching of several deaf ski and snowboard instructors. Read the story here. KGPE in Fresno, California reports on a special play for deaf students. Watch the video below or read the story here. Working toward a Masters in Creative Writing, Aliya decided to head to Sri Lanka and work at a Deaf School. Find out why here. The National Institute for Occupational Safety and Health and the National Hearing Conservation Association is giving its Safe-in-Sound Innovation in Hearing Loss Prevention Award to the hearing loss program at the University of Northern Colorado. UNC’s Dangerous Decibels program is a collaborative effort with Portland State University, Oregon Health and Science University, and the Oregon Museum of Science and Industry. The goal is teaching young people how to protect their hearing, which is often damaged through loud music played through ear buds, loud concerts or by noise at sporting events. Dangerous Decibels encourages youth to do three things to protect themselves from loud noise: walk away, turn it down and cover up. The program has students researching way people can protect their hearing. Rapper Sean Forbes got interviewed by WTXF-TV in Philadelphia. Watch the video on DeafNewsToday.com posted below (captions included). It was standing room only last night as Marlee Matlin spoke at Central Michigan University. Find out what the Academy Award-winning actress had to say here. UC Berkeley linguistics lecturer Patrick Boudreault, who is deaf, explains that language is something universal that happens in our minds, whether it's communicated with our hands or our voice. Gangs in China have been abducting deaf students and forcing them to commit crimes, according to the Beijing News. Police have arrested some 360 people in a nationwide crackdown--including China’s most-wanted man. Authorities say Yang Erdu was behind the operation. The suspects belong to 61 gangs from provinces across China. The scheme that has gone on for more than two decades. The photo you see is of a deaf woman meeting her family after being kidnapped 21 years ago. Police rescued 70 deaf people in all who had taken part in more than 300 crimes. Many are teenagers who were not allowed to contact family members or speak to strangers. Those who disobeyed were punished by have their ears and hand tendons cut. If the deaf captives were arrested, the gangs threatened them with harm if they revealed who was behind the crimes. The gangs often used Chinese sign language to communicate with each other and their deaf captives. Members of the Deaf community often get misdiagnosed and inappropriate treatment is given when they are suffering from mental health issues. That's the finding of a new study out of the Indiana University School of Medicine. Researchers found there are few health providers who are suited to work with the Deaf population--that is, health professionals who know ASL, have been exposure to the Deaf community, and understanding Deaf cultural values. The situation is especially difficult, the researchers say, when it comes to diagnosing serious problems, such as schizophrenia. For instance, explaining the concept of "hearing voices" or "talk therapy" to someone who has been deaf from birth. They call for specialized mental health training for ASL interpreters who work in psychiatric settings. Details of the study are in Journal of Psychiatric Practice. An app for the deaf won a software competition over the weekend in San Diego. A team from Cal State Northridge beat out teams from teams from USC and UCLA at the SS12: Code for a Cause contest. Teams of five students only got two weeks to come up with the software. The winner is an Android application that can interpret loud sounds like crying babies, sirens, smoke alarms, car horns and then turn them into flashing lights, vibrations and texts. You can even download the app for free on Google Play. Cal State Northridge's 28th Annual International Technology and Persons with Disabilities Conference was sponsored by Project Possibility, a nonprofit group dedicated to creating open-source software for the disabled. Josephine Siao was born on this date (March 13, 1947) and became a teen idol during the 1960s. She was a household name for her work during the golden age of Hong Kong cinema despite losing hearing in her right ear at the age of two. 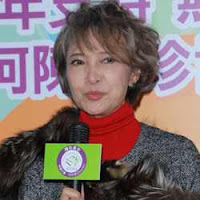 Now retired and losing more of her hearing, Siao has become a writer and psychologist. The body of a student from the Rhode Island School for the Deaf who left just months ago has been found inside a 55-gallon drum at a Harlem apartment. Watch a video report from WJAR-TV below on DeafNewsToday.com or read the story here. Read the story about what C.J. Jones is doing here. CNN told a California court yesterday that it shouldn't be required to provide closed-captioning for every video clip on its website. Lawyers for the Time Warner network says it would slow down its ability to report the news, add cost and make the information less accurate. In fact, CNN argued that the requirement is a violation of its First Amendment rights because the network has been singled out while the FCC is working on new online closed-captioning regulations CNN wants the Ninth Circuit to reverse a lower court ruling in favor of the Greater LA Council on Deafness. The lawsuit was brought on behalf of deaf Californians who are hoping to set a precident for the entire news industry. CNN already provides captioning on its television broadcast, as required by law, but does not do so on its website. New FCC rules will soon require recently captioning for professionally produced online videos, including newscasts, but the regulations do not cover short clips of less than 3 minutes or so. The storyline on the recent all-ASL episode of Switched at Birth was about the closing of a deaf school. Unfortunately, it's not just something on TV. Deaf school really are facing closure. Read more in The Jewish Week here. The National Orchestra of Wales has come up with a way to make music more inclusive: by opening it up to the deaf community. Freelance musician Andy Pidcock worked with the Orchestra to come up with a "sound box." Through vibrations, it transmits music to deaf people who can put their hands on it or even lie on top of it. Pidcock talked to NPR about it through an interpreter. Listen or read the story here. A Canadian man says his deaf son was pushed off the balcony of a third floor hotel at a resort along the Mexican coast. Ron Simpson says his son Kevin Simpson suffered a skull fracture and broken hip after he was robbed in Cabo San Lucas. Simpson hopes they can return to Kamloops, British Columbia soon, but Kevin remains hospitalized. Rapes and assaults of deaf and blind students in Hawaii public schools have some calling for the federal intervention. Below is a video report on DeafNewsToday.com from KHNL-TV.You can read the story here. A Denver-area town is settling a lawsuit over sign language interpreters. William Lawrence and the Colorado Cross-Disability Coalition sued the Englewood Police Department after Lawrence was arrested in 2011. Englewood officers did not provide him with an interpreter during questioning and he was kept handcuffed, leaving him unable to communicate. A day after his arrest, Lawrence was transferred to the Jefferson County Jail. He was then provided with an interpreter. Englewood Police claimed passing notes was good enough, but facing a likely loss in court, the department agreed to provide interpreters to any deaf people who are arrested, detained or questioned. But even with the settlement, Englewood refused to admit any wrongdoing. Learn more about the Colorado Cross-Disability Coalition here. ABC's Nightline broadcast from 25 years ago today - March 9, 1988 about the Deaf President Now protests at Gallaudet University. It's a fascinating look back in time with an interview of Academy Award winner Marlee Matlin. Watch the video below on DeafNewsToday.com (with captions). Here's a video from 1976 of news presented for the deaf by WMAQ in Chicago. The news anchor reads the news while signing it. What it is like to lipread? "Sometimes I feel guilty that I lipread at all. I fear that I am betraying myself by accepting the conventions of the hearing world. I fear that I lack balance—that I am abandoning the communication tactics that work for me, in order to throw myself headlong at a system that does not care about my needs." Those words come from a piece written by Stanford grad student Rachel Kolb. Learn more about the secrets behind lipreading here. A program in Minneapolis for deaf children may not survive. KARE-TV has a video report, posted below on DeafNewsToday. Or you can read the story about the Northern Voices program here. Film festivals around the world have praised deaf animator Braam Jordaan for his CGI animation. Born profoundly deaf, Jordaan recently wrote and illustrated a children’s book, and he’s in the process of creating an animated dictionary for children. Find out more here. Arkansas lawmakers are proposing a bill that would affect sign language interpreters in the state. KATV has a video report posted below on DeafNewsToday.com (captioning included) or you can read the story here. Students from around the country are getting ready to head to Washington, DC to take part in Gallaudet University's Academic Bowl, which starts Sunday (March 10-12). KRTV reports one of the teams--the Montana School for the Deaf and Blind. Watch the video report below on DeafNewsToday.com or you can read the story here. The World Deaf Ice Hockey Championship will be played from March 30 to April 6 in Vantaa, Finland. Find out about some members of the American team here. A deaf Texas fifth-grader won her school's spelling bee contest in Wichita Falls. Yaquelin Anaya now moves to the regional contest, which takes place two weeks from Saturday (March 23). She will face 25 other children in the Scripps Regional Spelling Bee--the first time a hearing loss student has advanced this far in this region. The definitions of words she is to spell will be signed to her, though she must spell the word in English, as the other children do. Yaquelin has an cochlear implant attends the Cunningham Regional Day School for the Deaf. Only Spanish is spoken in her home, so Yaquelin is learning three languages: Spanish, spoken English, and ASL. A deaf Chinese girl, found abandoned on the street, hears for the first time after being adopted by the owner of the Scholl Center for Communication Disorders. Oklahoma's KOTV has a video report below showing her after her cochlear implant has been activated. You can also read the story here. Rapper Sean Forbes will play in New York tonight at Webster Hall. WNYW-TV has a report on Forbes career in the video below on DeafNewsToday.com. A South Carolina teen is set to be the first deaf person to compete in the National Thespian Society Festival in June. You can read about the event here. Watch a video about the teenager here. (no captions). The Reddit Ask Me Anything (AMA) chats have produced some interesting conversations (if you can get past the off-topic and profile comments along the way). An AMA from earlier today was led by a deaf man with a cochlear implant who is born and currently living in Sweden. You can read the dialogue Here. Watch the full video of Academy Award winner Marlee Matlin appearing in White Plains, New York Tuesday. 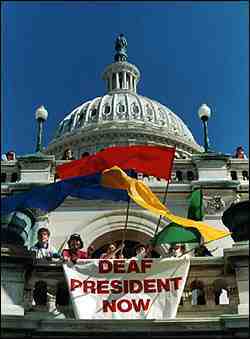 25 years ago today (March 6, 1988), the Deaf President Now movement begins at Gallaudet University. It comes to a successful end one week later when I King Jordan became the first deaf president of Gallaudet University in Washington, DC. The Associated Press reviews last night's Switched at Birth episode here. An Indiana man is facing charges for growing marijuana near the Indiana School for the Deaf. Prosecutors say 22-year-old Johnathon D. Averitte will face stiffer penalties because of the close proximity to the Indianapolis school. Police made the arrest yesterday. Salon reviews last night's all-ASL Switched at Birth Episode. Read it here. A team of researchers at Gallaudet University have created a new iPad app. It's first of three in a series of bilingual storybook apps designed to help deaf children with language acquisition. Gally's Science of Learning Center on Visual Language and Visual Learning is titling this first offering The Baobab. Gallaudet alum April Jackson-Woodard came up with the original story while deaf artist Yiqiao Wang created the animation. There is interactive support for ASL. 47 years ago the 28th NAD Convention took place in San Francisco. See what the National Association of the Deaf event looked like in this video that includes then Gallaudet President Leonard Elstad. Cochlear is reporting that its sales are at record levels - revenue of $391.7 million during the first half of the fiscal year for the Australian company. Net profit after taxes nearly reached $78 million. That's compared to a $20 million loss during the same period during the previous year. Cochlear had a product recall that cost it more than $100 million which you can read about here. Still, the stock fell 7.8% on the profit announcement, since investors had estimated there wold be a report of more than $80 million. Also, the Australian company lost some of its share of the market in Europe, the Middle East and Africa over the past year. Did city jail ignore ADA rights? A Colorado newspaper takes a look at the federal probe into the violation of deaf prisoners' rights in Denver. Read the story here. The New York Times profiles the agency responsible for sign language interpreting at South by Southwest in Austin. Read the story here. Hawaii's sign language may die out. There is only a small group of deaf islanders who are still abel to use it, according to researchers at the University of Hawaii at Manoa. They say Hawaiian Sign Language developed about 200 years ago, in the early 1800s. A letter written in 1821 letter to Thomas Hopkins Gallaudet from a protestant missionary makes reference to it. Only about 40 people are known to still use it - and most are over the age of 80. Out of 100 words, researchers found only 20 HSL signs were the same as their counterparts in American Sign Language. There are structural differences as well. For instance, in ASL adjectives come before nouns, but in HSL the noun comes first. The researchers will present their findings tomorrow at the 3rd International Conference on Language Documentation and Conservation in Honolulu. They plan to publish three textbooks on HSL along with a dictionary. 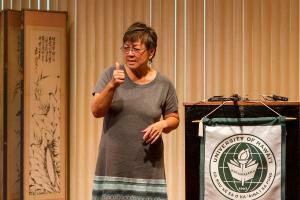 Read more about Hawaiian Sign Language in a University of Hawaii news release about the research here. Google is launching a sign language interpreter app and keyboard shortcuts tied to its video chat called Hangout. The Hangout Captions app, for example, enables live transcription services for the deaf and hard of hearing. It allows you to invite interpreters to speak and sign for you during a Hangout. You'll see your interpreter at the top right of the window and become the focus of the Hangout whenever their interpreter is speaking for you in sign language. Check it out here or you can directly install the app using this link. Then there's something to make it easier for sign language speakers to do a Hangout together. Look at the new Take the Floor here keyboard shortcuts. If can't or don't want to use a mouse during the video chat, you can use these shortcuts. To view the full list of keyboard shortcuts just type '?' while in a Hangout, or visit this page. Here's a video about Take the Floor which allows you to "take the floor" in a hangout with no mic.